Tides are caused by gravitational interaction and rotation of the earth-moon system about a common center of mass located inside the earth. (There is also a minor effect from the sun’s gravity.) As the earth rotates, the interaction causes two high tides and two low tides per day at any point on a coast. The change in water level between a high tide and low tide can be harnessed to produce electrical power, or the current can be used to turn turbines. 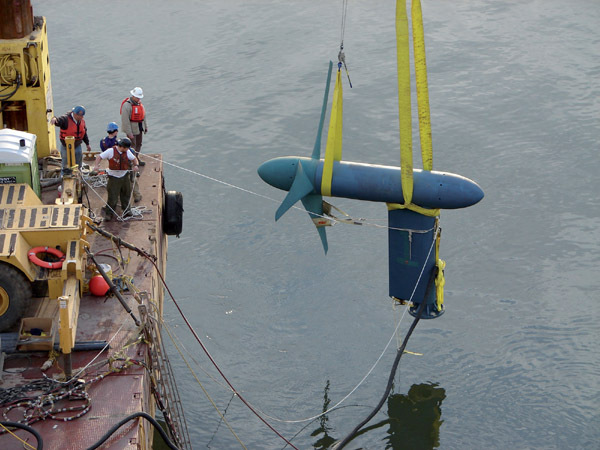 Various methods of harnessing tidal energy are discussed in this section. The gravitational pull of the moon causes the ocean to bulge in the part closest to the moon. The bulge in the ocean is known as a high tide. When the bulge reaches the coast, a high tide occurs. A second bulge can be found on the opposite side of the earth due to the earth’s orbital motion. The earth-moon system actually rotates about a common center of mass that is located inside the earth and in the direction of the moon. This pivot point for rotation is the offset that causes the earth to experience a force that pushes water away from the center of mass on the opposite side, much like what happens if you swing a bucket of water in a circle. The bulge on the side toward the moon is responsible for one tide, but the effect of centrifugal force is responsible for the bulge on the opposite side. The actual time between high tides is approximately 12 hours and 25 minutes, which is the time required for the alignment to occur again. Because of varying ocean depths, landmasses, and other factors at different locations on earth, the actual tides vary. When the sun, moon, and earth all align, a stronger gravitational pull occurs on the oceans, and higher and lower tides called spring tides are produced. A spring tide has nothing to do with the spring season of the year; rather, it occurs at new moon and again at full moon (approximately twice a month). At first and third quarter, the net gravitational force of the sun and moon is not as pronounced, so lesser tides than normal, called neap tides, are produced (neap tides also occur twice each month). The currents associated with the tides depend on the particular location on earth; currents from tides can vary from 0 to over 2 m/s. A tidal barrage system is designed to convert tidal power into electricity by trapping water behind a dam, called a tidal barrage dam, and generating power from the inflow and/or release of water. The tidal barrage dam is a large dam that stretches completely across an estuary, harbor, or river that connects to part of the ocean that has a tide. When the tide rises, sluice gates open to allow the tide to flow through tunnels and fill the area behind the dam. When the water is flowing into the area behind the dam as the tide is rising, it causes the turbine to rotate and produce electricity. When the tide reaches its highest level, the gates close, capturing the maximum amount of water behind the dam. When the tide drops, it creates a difference between the water behind the dam and the water in front of the dam that is at the level of the low tide. When the difference is large enough, the flow valves are opened so that the water flows under the dam through the tubes and past a generator turbine, causing it to turn and produce power. The barrage continues to fill and empty twice daily as the high tide comes in and then changes to a low tide. A conceptual plan for a tidal barrage system is shown in Figure 2. Because the barrage dam stretches completely across the harbor or river, it must have a lock to accommodate shipping or boating. The cost for installing a tidal barrage dam is very high, and only a relatively few locations in the world have sufficiently high tides to make it economically viable. The world’s largest tidal power system, the Sihwa Lake Tidal Power Station, is located in South Korea. This system, which opened in 2011, is a 254 MW tidal barrage dam west of Seoul, South Korea. The dam is 12.7 km (7.9 miles) long and uses ten 26 MW turbines positioned on the ocean floor. The area of the basin is huge, measuring 43 km2 (17 mi2). Because of water-use concerns, the turbines run only as sea water moves into the lake and not in the opposite direction. g = gravitational constant = 9.8 m/s2 shows that the stored energy is proportional to the height squared. Equation 1 shows that the stored energy is proportional to the height squared. As the water level drops in the barrage, the power is dropping because the head is reduced. Determine the theoretical energy stored in a barrage if the height of the tide is 3m in a barrage with an area of 300,000 m2. The barrage drains in 10 hours; calculate the average power. A tidal stream generator (TSG) is an electrical generating system that is anchored on the bottom of a river or stream to capture energy from the natural flow of the stream over the turbine blades. The turbine is connected through a gearbox to a generator, which produces electricity. Figure 4 shows a small three-blade tidal stream generator. Figure 4 Three-Blade Tidal Stream Generator in the Process of Installation in the East River of New York. Streams that empty into the ocean have water levels that raise or lower with the tides in the area. When the tide rises, water can flow upstream in the lower portion of the river, and when the tide becomes lower, water flows back to the ocean. This return flow causes a very strong current that moves a large volume of water over the blades of the water turbine generator, causing it to rotate. The turbine is designed so it can rotate to optimize power for incoming and outgoing tides. Figure 5a shows an example of a water turbine rotating when the tide is coming in; Figure 5b shows an example when the tide is going out. The main restriction to blade size is the depth of the water at low tide because the turbine needs to be anchored where it remains under water. Figure 5 Tidal Stream Generator. The movement of water in a tidal current generates power for both inflow and outflow. Generating electrical power from tidal energy has advantages and disadvantages. One of the biggest advantages of tidal energy is that the tides are predictable and occur all along the oceanfront; however, the current is not constant but fluctuates as tides move in and out. The location of turbines underwater is an advantage because it eliminates noise and a large visual presence. The main disadvantage of tidal energy systems is the initial expense of installation and the upkeep of a marine system located in saltwater. Other concerns include the effects of any system on fish, seals, marine life, and birds. A concern for barrage dams is the effect on fish migration patterns as well as fish mortality due to passing through turbines. Another concern is the changing patterns for sediments. When water containing sediments slows, the sediments that were suspended in the water tend to be deposited. Sedimentation tends to decrease the intertidal area, which can affect shellfish and can kill clams. It can also affect other marine life, including fish by reducing fish spawning areas, and bird habitat. The extent of effects on wildlife varies depending on the specific location. Depending on the source of the sediments, the net effect is cumulative changes in deposition and erosion patterns that can have negative environmental impacts. Explain what causes the tides to rise and fall. How often do spring tides occur? What causes them? What is a tidal barrage power system? How does it work? Explain how to estimate the total stored potential energy in a tidal barrage. What is the advantage of a crossflow turbine in a tidal application? The moon provides most of the gravitational pull that creates the tide closest to the moon. The tide on the opposite side is due to the orbital motion of the earth. Spring tides are larger than average because of the alignment of the sun and moon with the earth and they occur approximately twice each month. A tidal barrage system includes a dam that traps water from changing tides and generates power from the inflow and/or release of water. The potential energy is the mass of the water behind the dam multiplied by its average height. A cross-flow turbine can generate power from incoming or outgoing tides.